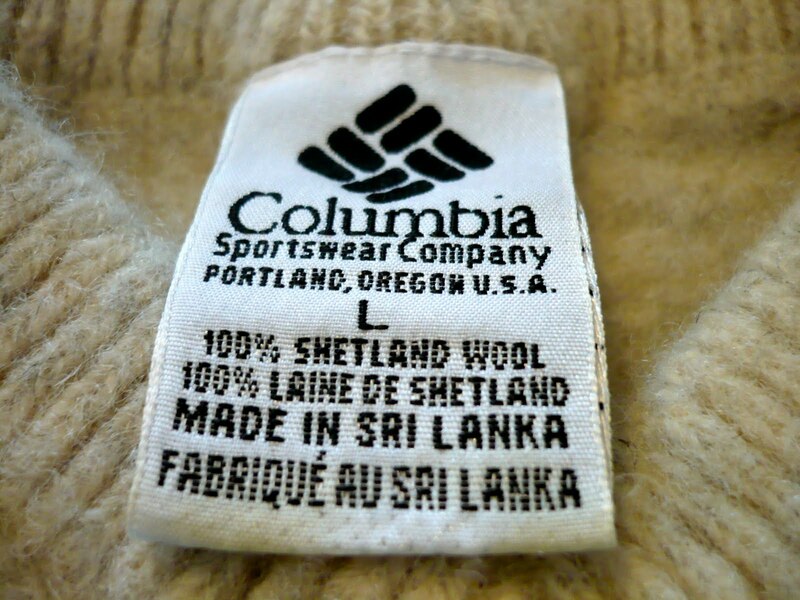 One of the first shopping trips to search for wool sweaters yielded a large creamy shetland wool sweater made by Columbia. 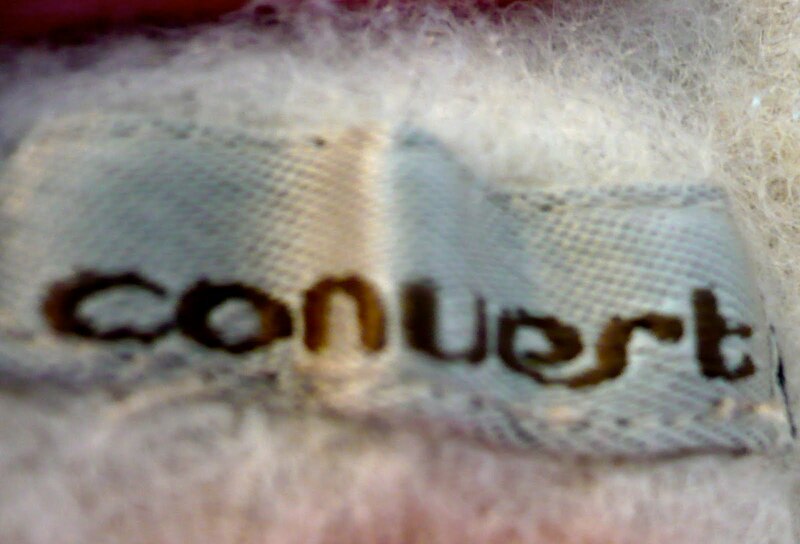 There was this little tag on the sleeve that said “Convert.” I thought that quite an apt label. 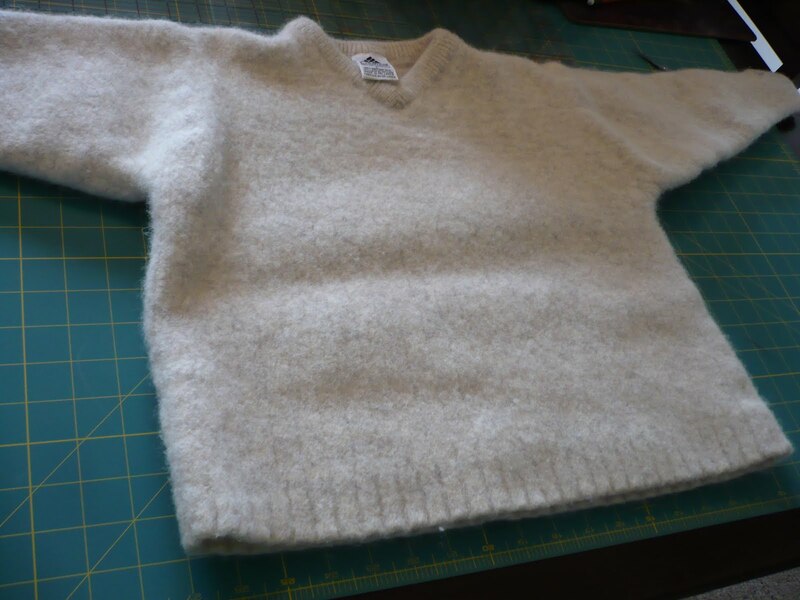 After washing this particular sweater it shrank a lot and was quite thick. I wasn’t sure what to do with it. 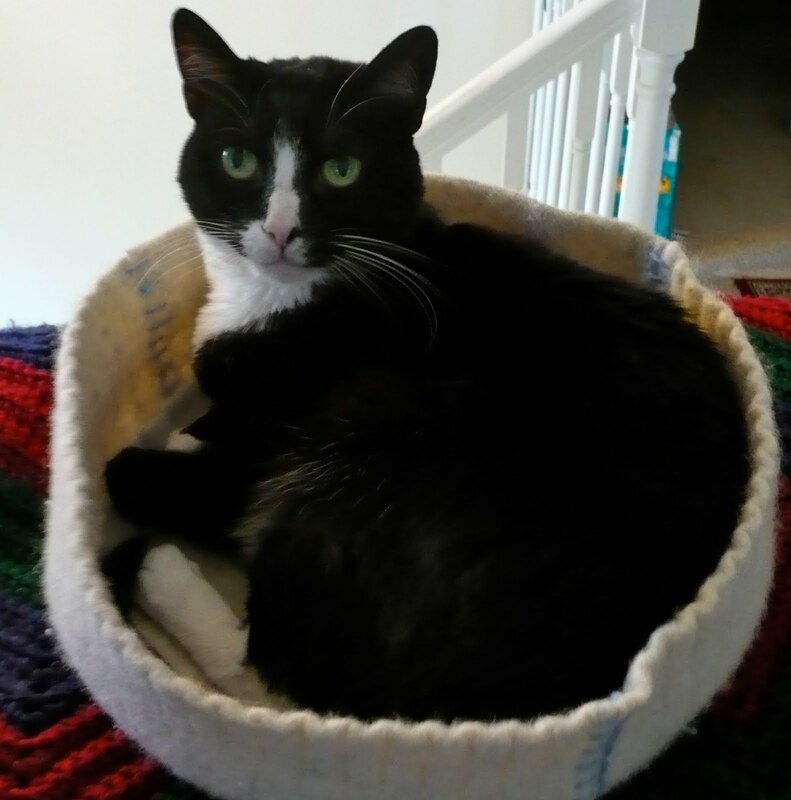 Then I thought it would make a great kitty bed for our little Pye kitty. Her crochet mat has kind of been claimed by Sam, our large siamese, so I thought she’d like a new one for the living room. 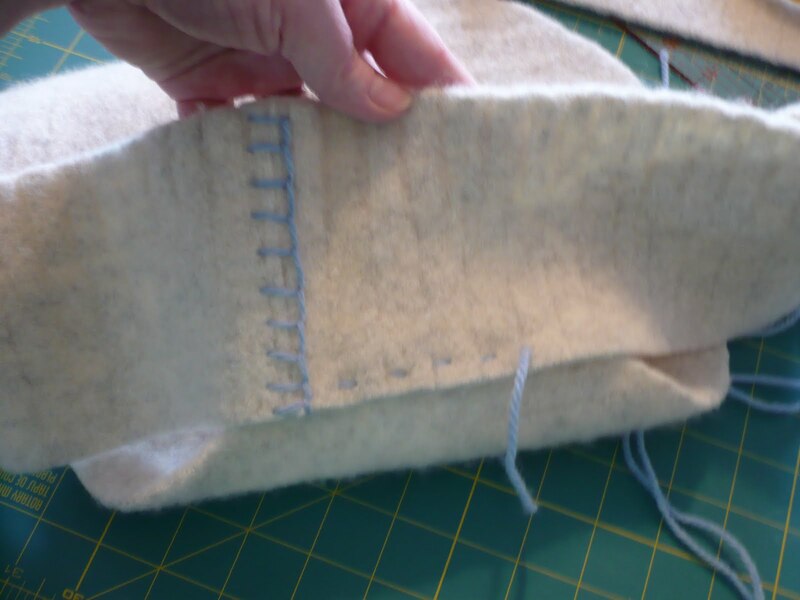 First I cut apart felted sweater at the seams and cut away the thick felted seams. Then I found Pye asleep on the back of the couch and measured around her then transfer the tape measure to the back piece to make the bottom of the bed. I enlarged the circle about an inch to give some ease. She is very much a “cinnamon bun” type of cat, so a circle works well for her. If I made one for Sam it would be much more oval, he is much more a “loaf” laying kitty. Then I needed to cut the sides. 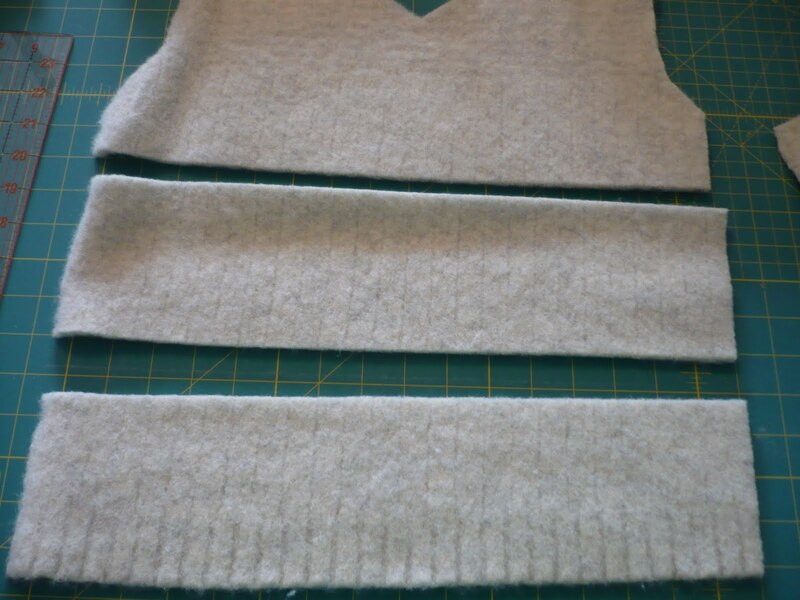 I used the bottom edge of each piece, front and back, and a second length from the middle. 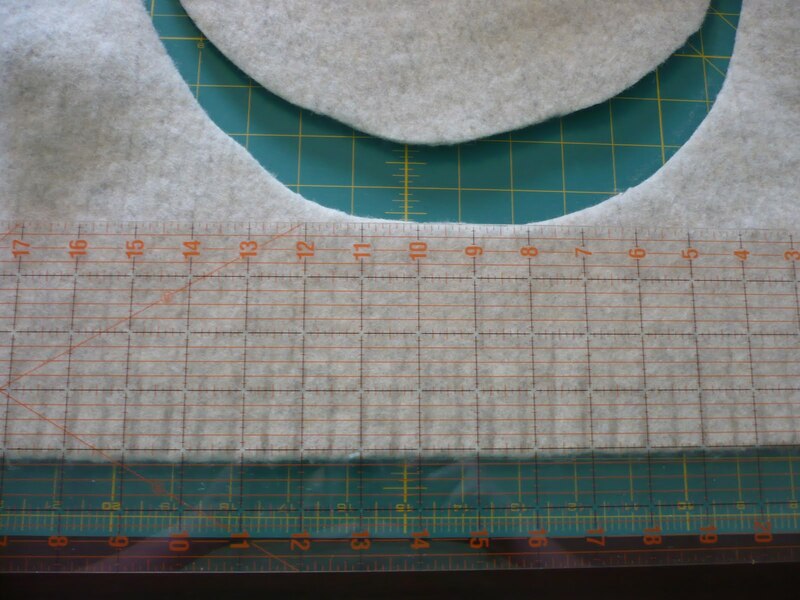 I used my long quilting ruler and rotary cutter to make sure I had nice straight lines. I needed 2 whole pieces and about 3/4 of the 3rd piece to go around the mat. 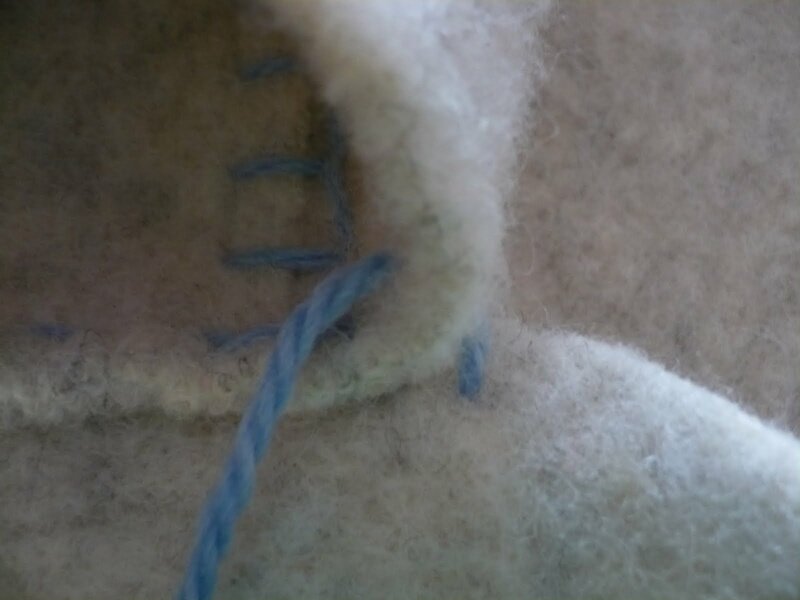 The sides I put end to end and just used a simple blanket stitch to sew them together with some left over blue wool yarn. 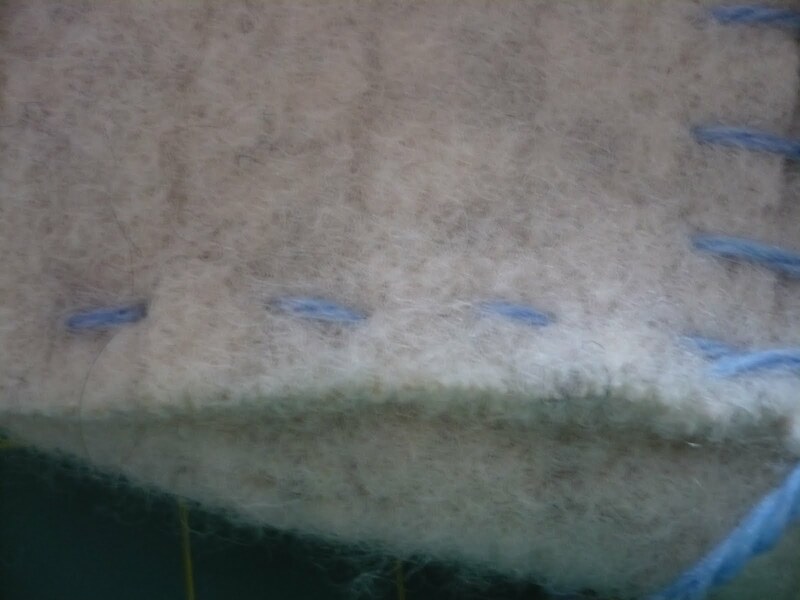 Once all three pieces were together I wrapped them around the mat bottom to see where to trim where the sides met and sewed them together. 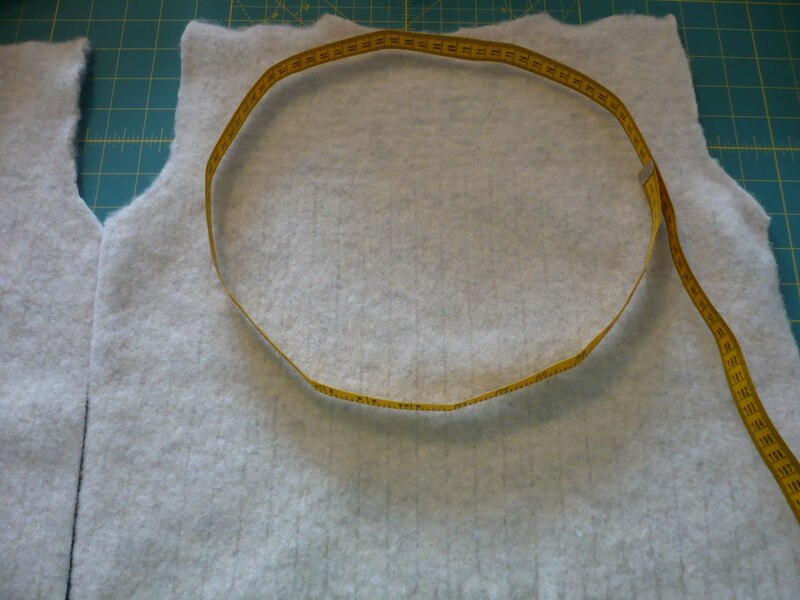 I overlapped the sides and the bottom a little less than a half inch to get the sides to stand up a little better. 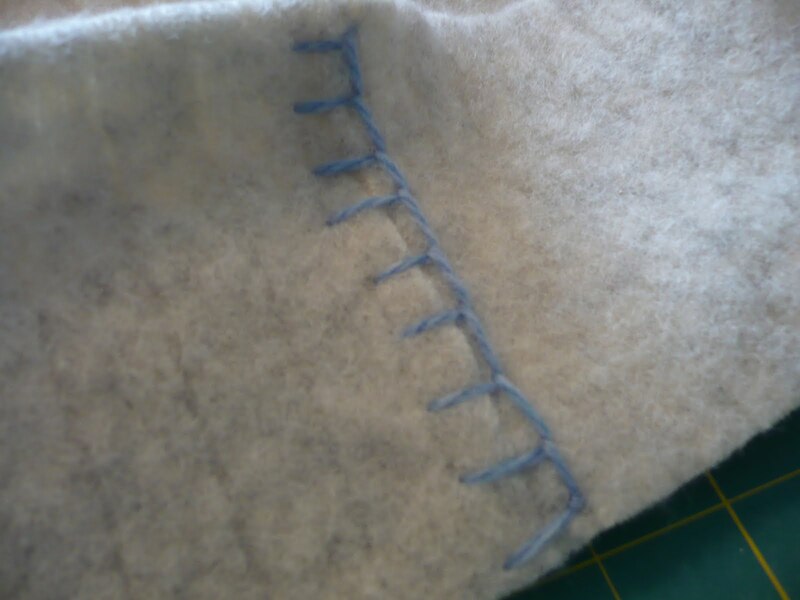 I used a plain running stitch to sew them together all the way around. 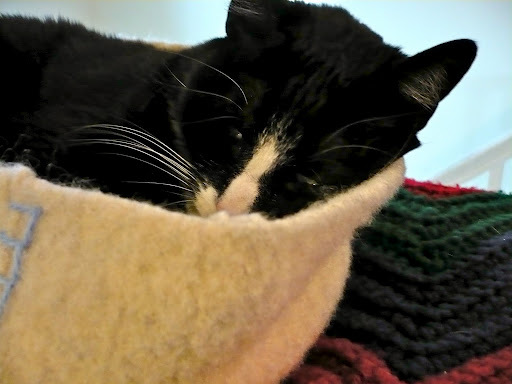 Happy Pye kitty testing out her new bed and settling in. :) I think she likes it. This bed took me about an hour to make and the sweater was $2.50. Hooray for up-cycling! 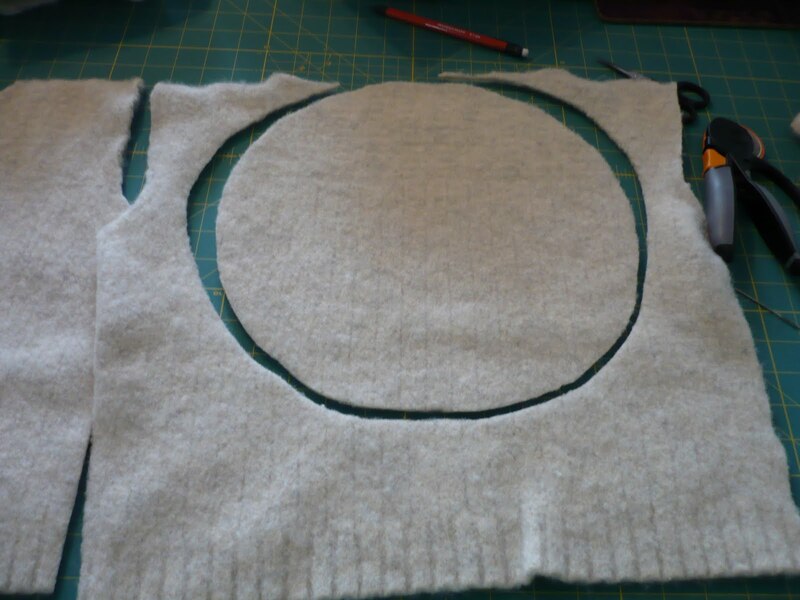 I still have the sleeves of the sweater left and a bit from the body. I’ll figure out something to do with them another day. 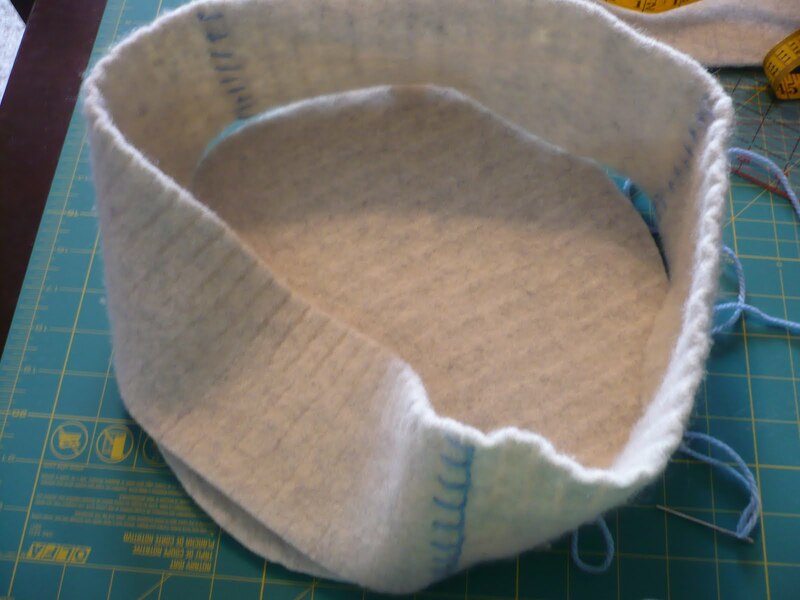 This entry was posted in cat, craft, hand sewing, repurpose, reuse, sewing, sweater, up-cycle, wool. Bookmark the permalink. My cat would be totally jealous. . .